As I mentioned in my last post, I recently decided to try out some online personal styling services. 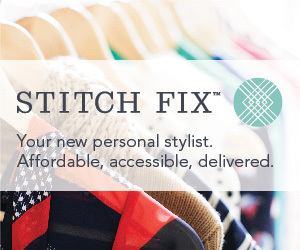 I am planning to tell you about all three that I signed up for and the first one up is Stitch Fix. Before I signed up to try it out, I scoured the web looking for details about the type and quality of clothes that women typically got in their boxes. I was interested in the quality of the construction, the fabric content, and the finishes. Unfortunately, I couldn’t find much info on these things. So I decided when I received my box, I would write about these details, regardless of my overall experience. Fortunately, my overall experience has been positive, so that is a bonus! I won’t go into excessive details about how Stitch Fix works because there are plenty of other sites that do that, but I will give you the Cliff Notes version here in case you are completely unfamiliar. Stitch Fix is a web-based company that provides personal styling services to women on a subscription or on-demand basis. They collect information from you about your preferences in color, fit, fashion, style icons, accessories, etc. When you sign up for your first box, you agree to pay a $20 “styling fee” (more about that in a sec). Then, they assign a personal stylist to you who reviews your profile and your Pinterest board (if you have one), and she sends you a box of 5 items, most likely 4 garments and 1 accessory, personally selected to suit you. Your box arrives on or before the date you selected when you signed up and you get to try on your items in the comfort of your home and with the help of your hubby, bff, etc. You can mix and match with what’s already in your closet to help you decide what to keep and what to send back. If you love something but it doesn’t fit quite right, you can email them to see if they have a different size and if they do, they will send it. You have three business days to make up your mind. The $20 styling fee you paid when you ordered your box gets credited toward the purchase of what you decide to keep from your box. If you decide to keep everything, you get an additional 25% off everything. You send back what you don’t want and aren’t charged for those items. There is no additional charge for shipping either direction. If you try Stitch Fix and you love it, you can tell your friends about it with a referral link and you will get $25 each time one of them signs up (yes, that is my referral link and I would love it if you decide to use mine 🙂 ). So without further ado, here’s a fashion show for you, complete with both garment insides and outsides! First, the entire line up of the articles that came in my box. My first fix was a pretty neutral color scheme. I don’t mind neutrals but I also enjoy colors. I made a specific request for more color in my next box. The first garment I tried on was this white 100% polyester blouse with a black spade pattern on it. The fabric is soft and reminiscent of crepe de chine. The care label calls for hand wash and lay flat to dry but I will machine wash on delicate and lay flat to dry. I am excited that the garment was made in the USA! 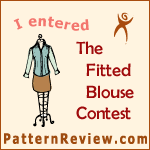 It has a button placket with bronze buttons in front and is accented by a bow tie at the neckline. The neckline is safe for work and the hem is a nice length for wearing tucked in or out. The blouse fits well through the bust but is a tad low in the armscye. This minor fitting issue was not a deal breaker, though, and I think this blouse will fit nicely as a multipurpose basic in my wardrobe. It has tucks sewn at the shoulders for bust shaping and no side darts for a loose, flowy fit. As for interior finishes, the back yoke and side seams are serged. The neckline has a clean finish. The armholes are nice and tidy with bias binding. Overall, this is definitely a finished product I would be happy to produce from my sewing room and reminds me of my Belle Bow Blouse in style and finish. I paired the blouse with the black ponte skinny jeans by Liverpool. I have to tell you I was soooo skeptical about these pants when I first pulled them out. I warned my stylist in my online profile that I had a really hard time finding pants and jeans to fit properly. But let me tell you, I wanted to cry with joy when I slipped these babies on. They fit PERFECTLY! They have the perfect rise in front and back, the waistband doesn’t gape, they flatter my booty. 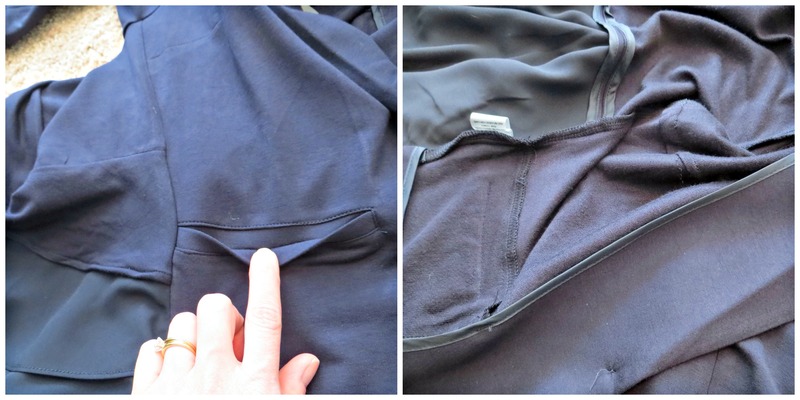 The fabric is a smooth black ponte knit that has great recovery so they don’t bag out after wearing. I love them so much I asked for them to send more in other colors if they have them. I didn’t take interior pictures of these pants but they are very straight forward — serged seams and basic 5-pocket styling with faux front pockets. The next garment out was this 100% polyester chiffon peasant tunic. I have to admit I wrinkled my nose at it a little when I pulled it out, but I was determined to be an equal opportunity shopper so I tried it on. You already know I kept the shirt — I liked that it fit in the shoulders, had a work-appropriate neckline, had a cute hemline that dipped lower in the back to cover the tush, and upon closer inspection, has an awesome bird print all over the fabric. Plus the top has a built in cami so I don’t have to worry about finding a clean one. The seams feature faggoting or entredeux which adds visual interest and texture. The interior seams are serged and sewn flat to the trim. The neckline features shirring with elastic thread and is finished with a placket and closed with yarn tassels. The sleeves have a simple placket and button closure. This cute navy knit jacket is 100% polyester and is the weight of a t-shirt. The back features a cute peplum details in polyester chiffon. The interior seams are finished with serging and a Hong Kong finish taking this jacket up a notch. There is a facing for the front and the back neck. There are faux welt pockets on the front. My fifth item is this cute long gold necklace with a design that mimics the white bow blouse, above. 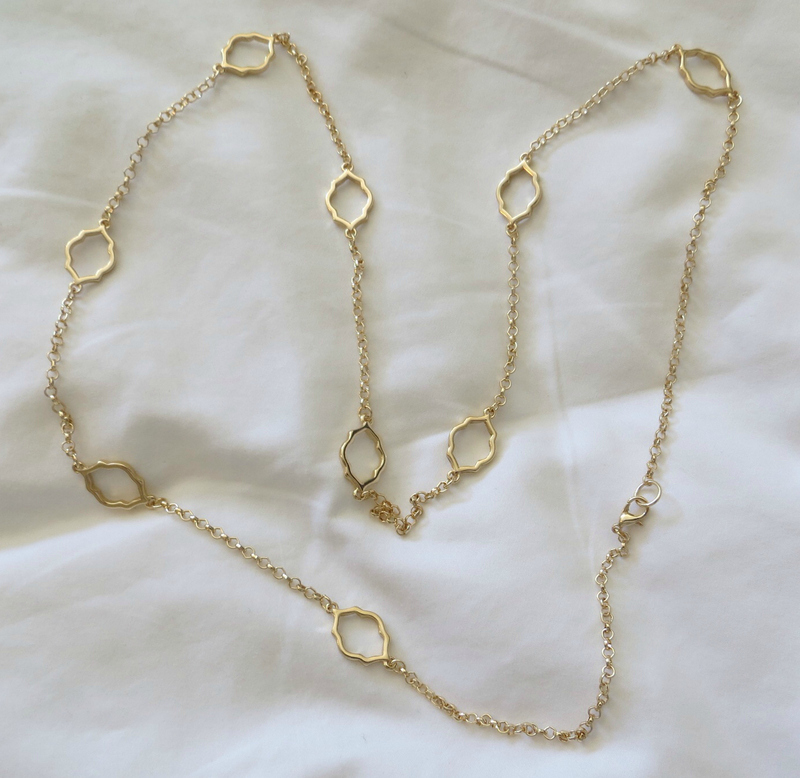 I had always shied away from longer necklaces because I felt like they looked funny on me, but I have been coming around to the look and was glad to see this in my box, especially since it is a great basic. It has already gotten quite a bit of wear since its arrival. 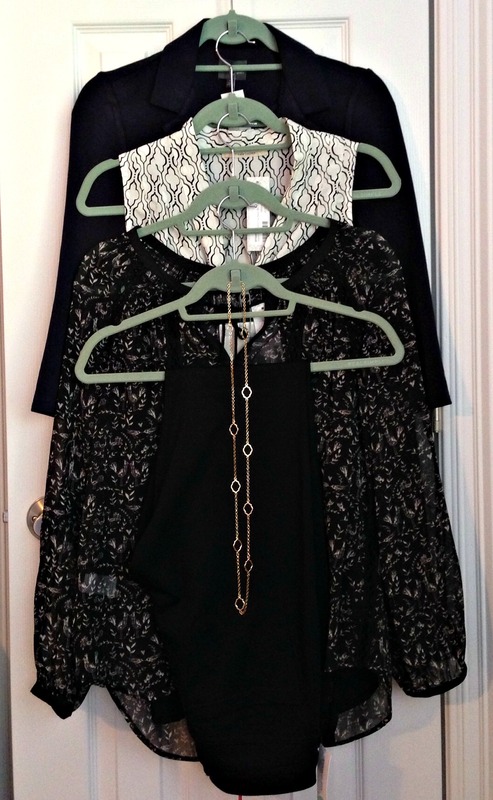 So, to wrap this really long post up, I had fun trying out Stitch Fix. I was satisfied with the quality of the garments in my box although I would love to see some natural fibers in the next box. I also loved that one of my garments was made in the USA. A lot of people will probably think the garments are a bit on the pricey side, especially if you are a bargain shopper (I know the girls in my office love to hunt for deals at places like TJ Maxx), but you have to consider that you don’t have to spend the gas driving to the store, the lost time you will be away from home/work/family/sewing, and you won’t have to spend money to feed yourself while you are away from home for half a day shopping. Plus you won’t be as tempted to purchase other things that you don’t necessarily need. And you can avoid the frustration that comes with searching through the racks not finding what you want. You also have the advantage of knowing that a professional objective third party selected the garments because they thought they would look good on you. I think the web interface for Stitch Fix is very easy to use and allows for great user interaction. I also think the $20 styling fee is reasonable since you get to credit it to the purchase of anything from your Fix (I will talk more about this when I compare all of the services later). I also think the referral program is great and means that you could really get a good deal on some clothes if you are comfortable sharing your experience about Stitch Fix with your friends — and you don’t even have to have a blog. You could share on Facebook, Twitter, Pinterest, or via email. I did contact Stitch Fix customer service once via email and my question was answered very promptly and the issue handled immediately and satisfactorily (I forgot to enter my friend’s referral code when I signed up). In summary (finally! ), I had fun trying out Stitch Fix and I can’t wait to see if my next Fix is better than this one. It has been a good treatment for my sewing dry spell. If you decide to try it out, click through this link to sign up and let us know what you think! Thanks for the detailed review. I’ve thought of trying Stitch Fix but haven’t yet. If I do, I’ll use your link! Hi, Laura. Thanks for commenting. Would love to hear about your experience if you decide to try it — I hope my experience so far isn’t a fluke! By the way, I may be in San Francisco in a few months and would love to hear the inside scoop on fabric shopping (anything other than Britex?). Wow! 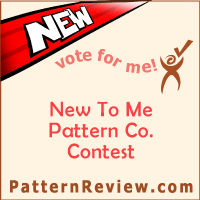 Those all look great – I will definitely be checking it out since I’m having such a long dry spell in the sewing room. They all do look nice on you. I like the peasant blouse the best…very dainty. I am definitely not retiring my sewing machine just because I can’t get to it at the moment. In fact, my grandmother just gave me her vintage Kenmore built into a little compact cabinet and it is getting tuned up so that may be the perfect solution to my small space sewing conundrum. Also, I bought some new patterns last week and just placed an order online for some new fabric. My sewing gears are always turning, lol! There are 1000 Stitch Fix reviews online but yours is from a unique, fresh perspective. I enjoyed it. Soon there will be 1001 as I am working on my blog site now. I am on my 4th fix. Thanks! Thank you Lisa! Your comment is so sweet. I look forward to reading your review. Please let me know when your blog is online. Just wanted to say how much I appreciated your stitch fix review. I’ve read a lot of stitch fix reviews, but yours is the first one to go in depth on the type of sewing and garment construction. That is very useful info! I just stumbled across this and loved reading a review from someone who knows about seams, stitching, and garment quality! Question for you: have you had any issues with the Liverpool pants? I got some in an Oct. 1 fix and LOVED them, but after only 3 wears, the stitching is coming apart on the backside. I’m bummed and have emailed Stitch Fix about this. I hope I just happened to get a randomly bad garment because I really liked them!